Facilitated by Tanzufer Bregenz www.tanzufer.at. Venue: The course takes place in "Bildungshaus St. Arbogast", www.arbogast.at , a lovely centre seated in the gorgeous countryside of Voralrberg, surrounded by forest and hills. 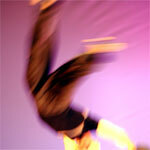 Location: Scotiabank Dance Centre, 677 Davie St., Vancouver, B.C. This seminar, which includes classes 3-5 of the Introductory Level, provides an insight into the basic principles of SRT. The improvisational work in the afternoon is informed and guided by these basic principles along with additional awareness of time, space and other compositional aspects. The workshop will be taught in English with partial translation into French. Fee: Sign up before 4 June - 110 euro. After 4 June - 135 euro. Participants that have joined at least 2 workshops of "Project D'ICI" in 2009/10 - 110 euro. Information & Sign-up: projetdici@yahoo.fr, www.projetdici.com. 30 May - 3 June, Mon-Fri, 10-13h. 18-22 July, 3 hours a day. For newcomers as well as for people with previous experience. It is also a a chance to deepen the experiential understanding and emobodiment of the principles of SRT. Deadline for registration is Friday, April 8th. This Intensive Course is an introduction to Skinner Releasing as a doorway into creative process and provides a first insight into the most essential concepts of SRT. Each day starts with a Skinner Releasing Class. The principles gained in the morning sessions serve as a guideline in the afternoon - a laboratory for improvisational and compositional practice that includes space for exploring individual ideas and the exchange with others. Facilitated by Marysia Stoklosa www.marysiastoklosa.pl. Early booking fee for sign-up before 31st June 2011! A wonderful opportunity to take daily classes in SRT followed by improvisation, with alternating afternoon workshops in site specific movement improvisation and aerial dancing on low-flying trapezes. Please note all classes will be taught in English. Next series begins Fall 2012. Register by phone at Northgate Community Center - 206-386-4283.